Divorce Attorney | The Ashmore Law Firm, P.C. Not everyone has a "happily ever after". Statistics show that up to 50% of all marriages end in divorce and the rate is higher for second marriages. There is now a larger percentage of people getting divorced between the ages of 45 and 64. Be informed before starting the Divorce process and if you have just been served with a Divorce Petition, educate yourself before hiring a lawyer so that you find the right lawyer for you.You probably never thought you would be in this situation, however, even with the best intentions, some marriages just don't survive. Divorce procedures in Texas can be challenging. Property acquired together must be split, as well as all assets that were obtained during the marriage. The State of Texas is a no-fault divorce state, which means you do not have to prove that your spouse did anything wrong. When a couple with young children divorces, it is vital to have an attorney involved in order to protect the children's welfare and to negotiate custody, support, and visitation agreements in a way that looks out for the children's interests. The best way to keep divorce proceedings civil and protect the interests of everyone involved is to hire a divorce attorney. 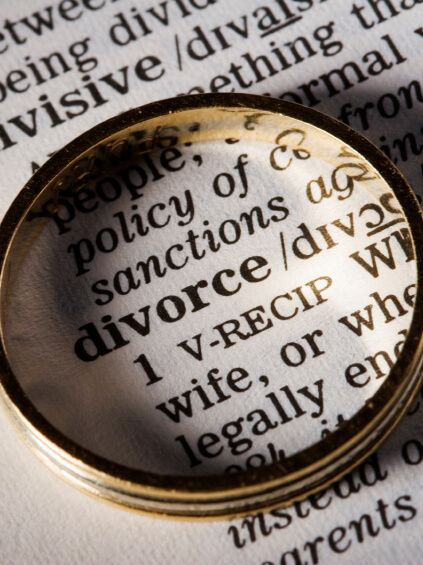 The attorney can help find fair and reasonable solutions throughout the divorce process, including the division of property, the distribution of assets, the selling or dissolution of a joint business, spousal support (alimony) and spousal support agreements, and representation in mediation or in the courtroom. A divorce case can overlap into other areas of the law, including taxation, real estate, businesses law and estate planning so the Ashmore Law Firm works with accountants, counselors and business appraisers to make sure that all your interests are protected to the greatest extent possible. To learn more about the divorce process, please feel free to contact us at 214-559-7202 to talk to one of our experienced attorneys who can answer your questions, or request our free book: Childless and Loveless: What you need to know about divorce in Texas.